In the last entry, I described how and why guitar #5 came to look as it did. Now it’s finished, having been clear coated, with a satin clear coat and assembled, set up, and tuned. One very interesting puzzle: we used this paint for the copper top coat. This is relevant because once the satin nitro finish was sprayed on (10 coats btw! ), the nitro seemed to shrink/dry in an eggshell pattern on the guitar, which you can see if you look closely at some of the photos below. Anyway, here is the finished guitar. Check out this amazing neck – AA flame maple! Here is the eggshell pattern I mentioned, as the nitro dried in a strange way on the copper paint. These lines are not etched by me. This is the first guitar I’d built where I needed to reverse-shim the neck. 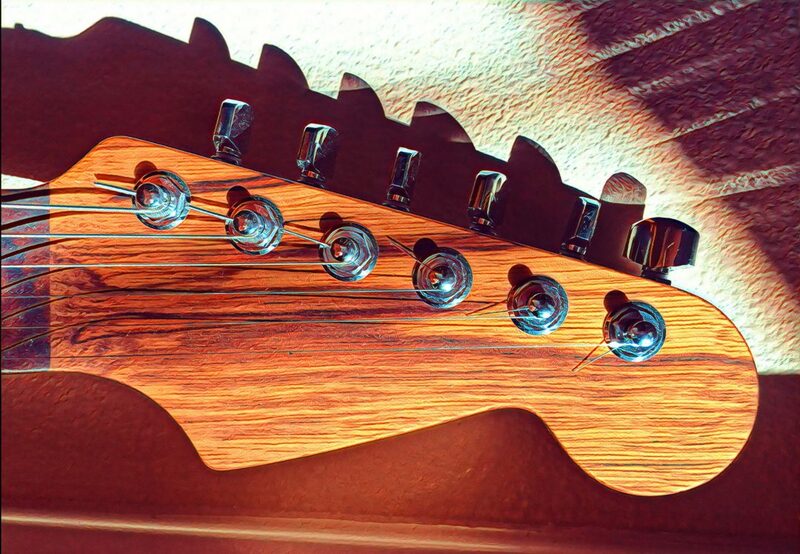 Adjusting the bridge, the strings could not be made high enough to clear the frets on the neck. At first I suspected a neck problem but after measuring the neck width where it meets with the guitar body (25.0 mm) and measuring the depth of the guitar pocket (16.0 mm) I realize the measurements were perfect, which could only mean a geometry problem. So I straightened the neck (truss rod adjustment) and added shim plates at the front of the neck pocket, visible in the photo below, which solved my problem. The shim plates are made out of cut up business cards. Shimming the neck results in changing the angle at which the guitar meets the neck, in this case lowering the neck in relation to the strings, which fixed my problem. I described finding another version of this problem in an earlier project here. I described the actual process of shimming a neck here. Notice the Fender neck plate on upside down? Duh. Now I just need to buy another guitar stand.